Pierre and I have been in France for a week and I wish I could stay for another dozen. The weather is horrible, non-stop rain and thunderstorms, and we nearly canceled the trip due to a last minute emergency on my part (the thing on my face turned out to be an infection requiring multiple doctor visits, medication, and I’m still in recovery). Then Pierre got food poisoning (no more steak tartare for this guy) our second day in Paris. It seemed like everything was working against us! But somehow, we managed and I can’t imagine a better vacation. …a peek at the magnificent Strasbourg Cathedral. Don’t forget about it’s equally famous astronomical clock. 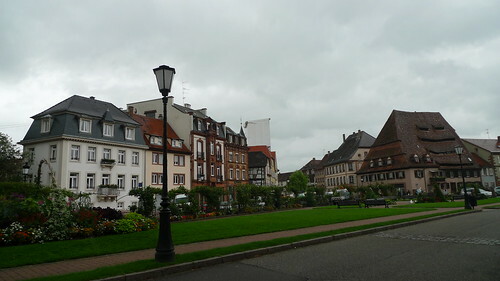 From Strasbourg we drove an hour north to a very small town surrounded by wheat fields called Wissembourg, Pierre’s hometown. It’s literally at the border of France and Germany, and the center of town is a single street lined in medieval-style buildings and a surprising number of pâtisseries, the windows filled with kugelhopf. The cheese course at the end of each meal. Usually about five cheeses, and always with a fresh baguette. …and then apéritif a few hours later. Pierre’s mom makes amazing fruit jams with fruit from her own garden. Three ingredients and nothing else: fruit, sugar, and lemon juice. Sliced baguette, butter, and then smear on the jam. Hot tea on the side. …the next evening we devoured a truly summer sweet plum tart dusted in cinnamon and sugar. On the savory side we ate zucchini gratin topped with grated gruyère. Done two ways: one with zucchini from the north of France (her garden) and the other from the south of France. We all concluded the one from the north was sweeter and more flavorful. …then fresh trout in a light cream sauce with toasted almonds. The trout was served with butter-cooked potatoes, each one so tiny, tender and sweet with just a bit of salt. Salads were no afterthought, this one done with grilled octopus and chives, a balsamic dressing. Water? Oh yes. Thermal water. The water in Baden-Baden is naturally hot, free for drinking and thought to have healing powers. Our trip was cut short from the thunderstorms and rain. But no worries, only a 30-minute drive back home, just in time for apéritif.